Dat Dog founded in 2011, has grown from a single, 475 Sq. 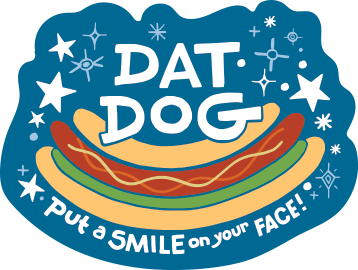 Ft. “Hot Dog Stand” into a New Orleans culinary institution with a devoted following, offering an array of gourmet sausages, all-beef hot dogs, award-winning French fries, premium spirits and a sampling of local craft beers, in a brightly colored, unpolished environment. This critically acclaimed restaurant – touted by The New York Times, USA Today, The Wall Street Journal, Travel Channel and Food Network – currently has three locations open in New Orleans, one in Lafayette, LA, and a franchise location in College Station, TX. Our happiness has spread to several more locations in New Orleans and elsewhere with beautiful balconies and sun-splashed beer gardens to enjoy one of our handcrafted beers or cocktails. So come, chill out and embrace your bliss!